Thanks to technological development, electronic drums are becoming an increasingly popular musical instrument for a broad spectrum of musicians. This boom in electronic drums is primarily the result of the fact that it is now possible to realistically imitate the sound of classic drums while also offering many interesting features such as sound modulation, effects, creating and recording one's own set and more. And above all – you can play in your flat without the plaster falling and forcing your neighbours to move out. With electronic drums you can play into headphones and the pad strikes are very quiet compared to acoustic drums. To give you a better idea about available products, we have prepared the following shopping advice on the subject of how to choose electronic drums. We recommend that beginners purchase a complete electronic drum kit with all necessary hardware and accessories (stands, pedals, etc.). Simply unpack these complete kits, and you're ready to play. Our current offer also contains individual pads, drum modules and combos for reproducing the sound of electronic drums. Producers are also developing other alternatives such as sampling pads, percussion pads or percussion effects. These instrument are used by drummers who want to enrich their drum playing with various electronic sounds. Electronic drums can also serve as a substitute for classic drums or as their extension. They are also commonly used as a practice instrument (the volume can be turned down easily). 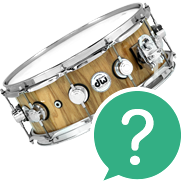 If you would like to consult with our experts on choosing electronic drums, you can call us at 020 8089 1481 (Mon-Fri, 9 a.m. - 5 p.m.) or send us your questions by email to . Our colleagues will be happy to help you with your selection. 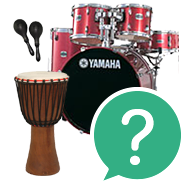 Classic acoustic drum kits produce sound on the principle of the mechanical resonation of the instrument. Electronic drums produce sound in a different way. The drummer plays on so called .pads and the strikes are electronically captured by the built-in sensors. The signals from the pads are sent for processing to the system's control unit, which then assigns them the chosen sounds. These control units are called drum modules, which is where all sound settings and similar operations are made. The quality of electronic drums naturally increases with their price, specifically the realistic drum-playing feel. Quality pads have a strike response similar to classic acoustic drums. Moreover, these pads can be dual-zone, which means that strikes to various parts produce a different response (typical rimshots). More expensive electronic drums will also have a richer sound bank. 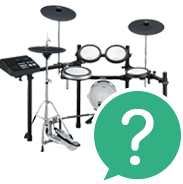 If you are a beginner, choose an electronic drum kit whose module contains some kind of training program, as it will help you learn basic rhythm, etc. The standard electronic drum module is equipped with and an output for a speaker and headphones, an input for an external music sources (mp3 player, telephone – allowing you to play with a musical background) and possibly also a USB interface for sound editing or an MIDI interface. The MIDI allows you to record the baseline onto the computer and assign various sounds to individual strikes.